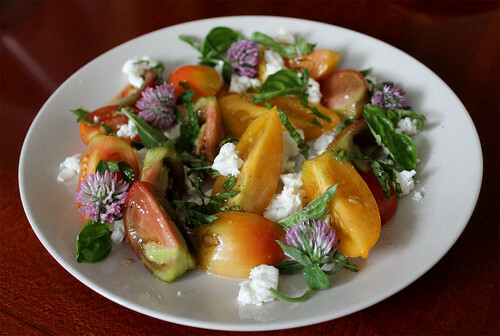 Like these beautiful heirloom tomatoes I picked up from the Evergreen Brick Works’ the other week. 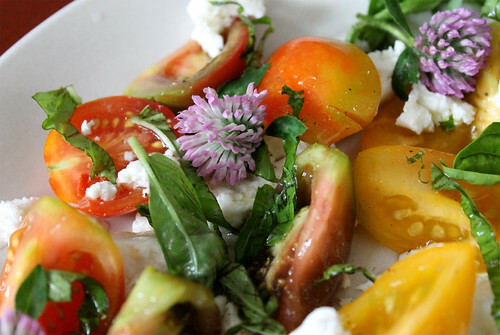 Best enjoyed in all its (almost) unadulterated glory in a light, summer salad that celebrates all things local, with Monforte Dairy fresco cheese, fragrant basil, and clover blossoms. 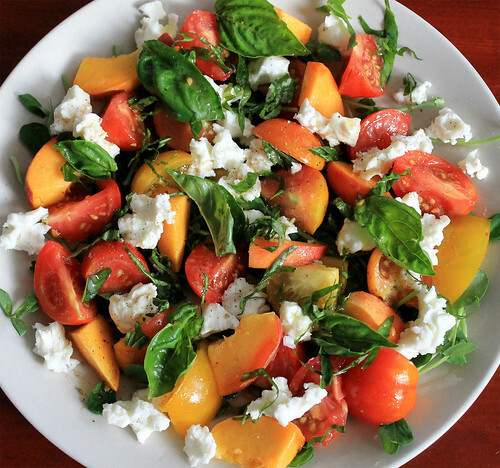 To make this incredibly simple salad, simply cut the tomatoes into bite size pieces and toss into a little bowl along with a sprinkle of salt to help draw out the moisture in them. Drain any excess liquid that has pooled at the bottom of the bowl after letting the tomatoes sit for five minutes, and sprinkle them with a little extra virgin olive oil and red wine vinegar. Season with some salt and pepper to taste, and let sit for another five to ten minutes, before serving with whatever accompaniment you’d like. These tomatoes are just as fantastic served alongside some sweet, juicy peaches, or use cherry or grape tomatoes and serve on top of broiled goat’s cheese on toast. A colour palette of colours on your plate. A burst of fresh flavours in your mouth. Enjoying the summer should always be this easy and pleasurable. Melanie September 8, 2012 at 12:19 p.m.
Is that clover in your salad? Amazing! and congrats on making it into the Post this week.